How to size up the colleges you're considering—and come up with a coherent list. What are "holistic", "contextualized", and "legacy" admissions—and how each can work for you. How some schools count "demonstrated interest"—and how you can take advantage of this little-known fact. When it's good to wait out the "wait list"—and when not. Lynn F. Jacobs is a professor of Art History at the University of Arkansas, having previously taught at Vanderbilt University, California State University Northridge, the University of Redlands, and NYU. Jeremy S. Hyman is founder and chief architect of Professors' Guide content products, (www.professorsguide.com) and lecturer in Philosophy at the University of Arkansas. He has also taught at UCLA, MIT, and Princeton University. 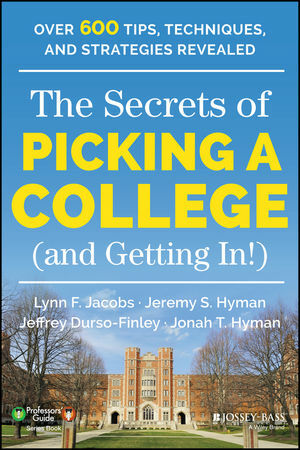 Together, they are authors of The Secrets of College Success: Over 800 Tips, Techniques, and Strategies Revealed. Jeffrey Durso-Finley has been director of college counseling at the Lawrenceville School, in Lawrenceville, NJ, for the last ten years. Before that, he served for eight years as assistant director of admissions at Brown University. Jonah T. Hyman is a senior at Haas Hall Academy in Fayetteville, Arkansas and is currently in the throes of the college pickingand, hopefully, getting inprocess.